Epay’s affiliate program is your opportunity to earn more. It allows participants to get 5% of their first-level referrals’ transactions, and 3% of their second-level referrals’ transactions. Developers and merchants can use Epay’s API to set up fast and smooth payments on their websites. In order to learn how to use the service, read the F.A.Q. section on the website. Epay’s customer support team will help you in case you have any questions regarding the service. RBK Money enables its customers to instantly pay for utilities, communication services, internet access, e-shopping on a PC or a smatphone (iOS or Android). It takes just a few clicks. You can also donate to charitable organizations, pay for presents, flowers or other services. You can use bank transfers and payment terminals to add funds to your account. The same applies to withdrawals. There are different types of membership. Personal accounts are used for casual activities like traveling. Business accounts help with collecting money and salary payments to employees. There are different fees for each type of accounts. 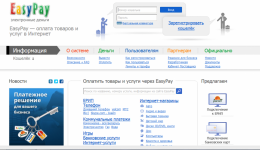 Easypay was launched on November 9, 2004. It is made up of 2 parts –”The Processing Center” and “The Bank”. The Processing Center performs wallet operations, it is supported by “Open Contact”. The Bank deals with Belgazprombank-provided money. In order to become an EasyPay client you need to register on the EasyPay website and create an e-wallet. You can register as an anonymous guest. You can add funds to your wallet through Belgazprombank ATMs, post offices, bank transfers, or credit (debit) cards, issued by Belgazprombank. 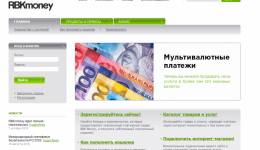 The primary currency, accepted by EasyPay, is the Belarusian ruble. But it is also possible to exchange that for other digital currencies, such as MoneyMail, e-gold, V-Money, UkrMoney etc. The minimum transaction amount is 100 BLR and the maximum equals to 200 EUR. EasyPay carries out a wide variety of transactions: transfers to other EasyPay users; transfers to cellphone service providers; to online shops; transfers to Minsk city authorities. 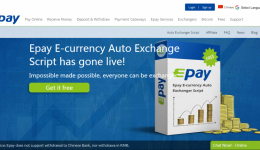 FasaPay is an electronic payment system of PT Fasa Centra Artajaya, located in Indonesia. 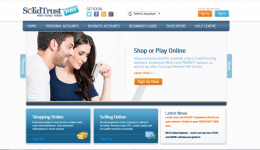 It provides digital payment services to different online stores which belong to FasaPay. It’s available 24 hours 7 days a week. It guarantees very quick and secure money transfers. Some e-currency transfers are automated: API, SCI and IPN. If you are a FasaPay customer, you can make online purchases and transfer money to other FasaPay customers. Deposits and withdrawals can be done through banks. The deposit and withdrawal fee is 0,5%, and the maximum tax amount is $5.00. FasaPay is safe to use, since all information about transfers is encrypted by AES-256. All account data is protected by the Hardware RAID technology, meaning that all personal information is stored on separate hard drives. This service guarantees high transaction speeds. FasaPay means that all of your transfers are safe and your personal data is never accessed by third parties. AstroPay is the fastest growing payment solution in Latin America. It provides guaranteed payment solutions to consumers, avoiding issues like payment rejections, local taxes, fraud and credit approval. 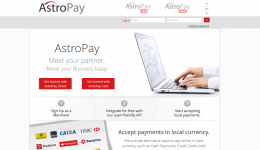 AstroPay also allows consumers to purchase online at international websites, using the most effective local payment methods in local currency. AstroPay, a UK company, operating in Latin America,covers all the major markets in the Latin American region, providing payment solutions in markets where most popular solutions are not available, or not functioning properly. We pride ourselves on our ease of use: simple integration and operation for our merchants; easy registration and usability for our customers. AstroPay is already the payment method of choice for thousands of Latin American consumers . Liqpay serves personal and business needs. It can be embedded into your website as a payment tool for purchasing goods and services. 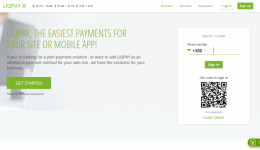 Liqpay is mostly used to pay for such services as World of tanks and MTS. There is a fixed fee of 2.75% per transaction involving Visa or MasterCard. Liqpay provides a fast and secure way of money transfer. All service fees are paid by recipients. A transaction usually takes 1 business day. SolidTrust Pay offers two types of accounts for personal and business purposes. By opting for a business account you get an opportunity to receive payments right on your website in a number of various secure ways: credit or debit cards, e-wallets. It comes in three different forms: starter, micro payments and corporate, each of them serving the needs of every enterpreneur. The corporate upgrade raises all limits, gives a special online service and advanced fraud protection for just 50 dolllars. Starter is free and supports a number of services. Owners of personal accounts can apply for debit cards and participate in SolidTrust Pay’s affilate program. Customer service is available 24/7. 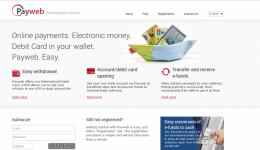 Payweb is yet another online payment system. It features two types of accounts: personal and business. It issues its own debit cards. Payweb enables you to send and receive money instantly, pay for online shopping and, if you get a Payweb debit card, withdraw money with the help of any ATM and buy groceries in convenience stores. Online shopping is safe with Payweb: no need to send any information whenever you place an order. Money transfers are carried out very quickly. It takes just a few minutes to type in a couple of words and digits. The registration process is standard. You need to fill out a form, entering your e-mail address and login. You will get an ID, which you will use for all of your transactions. It’s important to keep this ID safe and sound, since it is the only key to your account. After the appearance of Paypal and Moneybookers, the giants of electronic payments, digital gold is gaining its popularity. C-Gold (Commerce-Gold) was founded in Seychelles in 2005. It specializes in promotion of electronic payment platforms and market management. C-Gold has reserves worth millions. A total of more than 30 kg of gold is stored in Malaysia. C-Gold users can easily pay for shopping or services of online traders or other C-Gold users. They can check their balance, see previous transactions, make payments and even buy back their gold or sell it for cash or gold bars. C-Gold provides secure and instant online payments 7 days a week, with transaction fees as low as 1% and no risks. Many online shops, gaming sites, service providers, online auction sites and international businesses prefer C-Gold as a method of payment, and this list is always growing. A language-specific customer support service is offered by a growing network of franchises in several countries, while independent third-party exchangers help with maintaining the liquidity of the system and making C-Gold available all around the world. 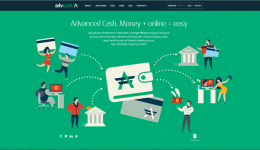 AdvCash provides you with a secure way of transferring money and making payments online using the most popular currencies. The service is available in 200 countries throughout the world. There are two types of accounts: personal and business. The latter charges lower service fees, gives a priority when sending requests, transactions are less limited and you can have your own manager. If you help promote AdvCash by advertising it on your website or blog or etc, you will receive some bonuses. As soon as you verify your account, you can create wallets in dollars, euros, pounds or Russian rubles. Topping up is possible with Bitcoin, Swift, SEPA and Wire transfers. 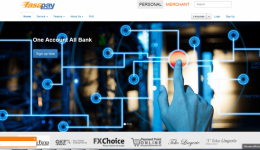 With AdvCash you can pay for purchases and services, perform international currency exchanges, pay in bulk and send money requests to those who are not Advcash customers. Plus you can have an electronic MasterCard and transfer money to any other MasterCard or Visa holder.